@kaolis Cracks wise, but also hit us with a solid Lab Rat Report It’s pretty even on the palate front to back, nothing sticks out, no holes. Nice finish. The Buoncristiani O.P.C. is our Napa Valley proprietary red blend. In the quest to create a wine uniquely ours, we discovered the synergy of marrying Napa Cabernet Sauvignon with Syrah, while also folding in further complexity of texture and flavor with Napa Malbec and Merlot blenders. Grapes are sourced from some of Napa’s most prestigious vineyards including Hyde, Stagecoach, Hossfeld and Bennett. Just like our winemaking fathers before us, with “Ol’ Pa’s Cuvée” we four brothers continue the family tradition of handcrafting blends that help accentuate the enjoyment of life. To ensure our highest standard of quality, the vineyards are managed by growers who adhere to our strict viticultural philosophy and the wines are crafted with our own hands. The components of O.P.C. were harvested and fermented separately in small batches, then carefully blended in several phases during the second year of barrel aging. This 2014 O.P.C. was aged in French oak barrels for 20 months and bottled in June of 2016. The Buoncristiani Brothers are bonded not only by blood, but also by a shared passion, vision, and dedication for handcrafting ultra premium wines that accentuate the enjoyment of life. We are four young brothers - Matt, Jay, Aaron & Nate - who were born and raised in the Napa Valley from a long lineage of Italian winemakers and wine lovers. We, the Buoncristiani brothers, take pride in performing all aspects of enology, viticulture, wine production, and art design in order to share with you a true expression of our winemaking passion. Our motto is quality not quantity and we craft our wines without compromise. Handcrafting these limited production wines ourselves allows for the utmost attention to detail of every drop of every gallon in each barrel. Even more interested after listening to Nate Buoncristiani’s podcast for this offer. Lots of interesting vineyard sources, different cooperages, toast levels, etc. adding to the complexity of this blend. I think I’d want expert (Peter W?) labrat reviews, and complete stats here: alcohol, pH, TA, RS, Brie at harvest, information on the type/age/toast of the oak, etc. @rpm Your wine advice is generally gospel to me but why would you say that this blend is more in Parker’s St Em/Pomerol wheelhouse? Are you just indicating new-school fruity vs. old-school graphite, etc? The blend appears to have only 12% merlot. Could you explain what you mean by this a bit more? @rlmanzo I did say closer… But, not to quibble, you’ve got me dead to rights. I was thinking more a wine that was less Cabernet and more a blend than even most California ‘Bordeaux’ blends, and you recall my oft-stated view that Parker does not have (and has never had), a clue about Cabernet Sauvignon. Interesting factoid: Parker encomiums of the 1982 Bordeaux (made in a more approachable style in many cases in a sunny year) made his reputation, and the reputation of the vintage. David Peppercorn’s more jaundiced view of the aging potential of the 1982s destroyed Peppercorn’s reputation. Now, 35+ years on, Peppercorn looks closer to being right than Parker, but few remember Peppercorn anymore. @rpm I agree with @rpm, would like to hear from some wine experts (like Peter, Kent, Scott, or RPM) here before thinking about pulling the trigger!! WD get those boys a bottle to Rat!!! @rpm Me too. Plus it’s always interesting to see the stats. Personally I think 07 is ripe as hell. @ScottW58 In terms of Parker ratings I was thinking of particular wines rather than vintages overall, but, since you ask… I think the 2005 were ripe, but often very well balanced - many long lived wines, but some early faders. As I’ve started to dabble in my 2005s, I’ve been pretty happy with their development. 2007 was riper than 2005, to be sure. I have tended to buy more 05s than 07s, but very producer dependent. I was selective with 07. I really haven’t started drinking 07s. I like 2009 as well, and I think 2012 will be one of (if not) the best vintages of the first two decades of the 21st century. Thanks for your thoughts I was just poking the bear I also like the 05’s but not as great as everyone was pumping it up to be and after the 07’s I get gun shy when I hear great things like vintage of the century, time will tell. And yes great producers will make pretty good wine in all vintages IMHO. @ScottW58 the only California vintage I remember having when it was young that fully lived up to the hype was 1970 for Napa Cabernet. The best of them were certainly still alive, though beginning to fade when I last had the BV Latour a year or so ago. I’m saving a bottle for my 50th college reunion and think it will be good (though not the wine it was at 40). Following to see what the consensus is. 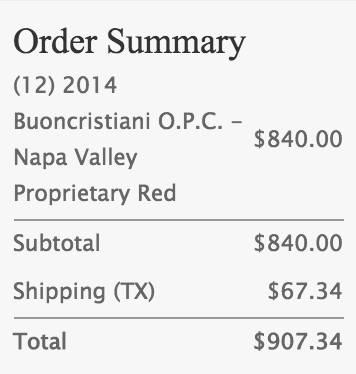 Goodness I’m intrigued but don’t think i can pull the trigger for a dallas case myself after doing the last Napa “black tie” offering that just shipped. BTW, What’s the drinking window on this 2014 vintage?? Based on my recollection of the 2010, this is most likely a very nice wine. I recall seeing the 2013 or '14 at Costco for about $55 so the price is decent. I am interested in a bottle especially if we are splitting a case. A bottle of this just showed up here on the east coast about 75 minutes ago. But don’t worry, I shook it up real well to integrate the sediment and it’s out on the deck in the sun to get it up to proper chugging temp. Heat index is 100 degrees F so it shouldn’t take long. Back soon! @kaolis Sounds like this will be my kind of review! @kaolis I hope you have the right kind of styrofoam cup to properly evaluate the wine! Anyway, upon arrival a good inspection of the bottle. It just went coast to coast, but all is good. Bottle is cool/not warm to the touch. Cork looks as clean as a whistle, maybe 1/8" of staining. No sign of any shipping troubles. Into the fridge, out at 5:30pm. Pulled the cork, took a whiff, the wine is sound. Temp 73.3F. Cork back in and returned to fridge. Checked again at 6:15, temp is 65.5. At 6:45 temp is 61.8 and did a slow pour into a decanter just to get it off some very slight sediment and finally a small taste for me. Impression: this is not an overripe Parkerized wine. Not at all. I bring that up because of previous comments. I know it’s in fashion for some folks to bash Parker just because. I also know he took hits for Aussie wines. I also know some of those wines have REALLY come into their own over the years. But I digress. Whatever. Color, not opaque but a medium ruby. Can’t read through it, but not dark. Nose is quiet but I get some spice and maybe a bit of tobacco? Right now I’m getting the syrah out of it, but it’s a bit of dancer wanting me to taste the cab. A bit of chocolate? But that could be the malbec or merlot. It’s pretty even on the palate front to back, nothing sticks out, no holes. Nice finish. Tannins are smooth and easy, fruit is plentiful but kind of hiding. Nothing here screams drink now but you certainly can, but I think a few years will be nice to it. And fwiw I tend to drink my CA wines before age 10. The blasphemy right! Oh, and the '82 Bordeaux wines that Mr. Peppercorn enjoys have a slight presence in my modest cellar. As long as we are aligning palates. Edit, in it’s syrah stage it kind of reminded me of a Lillian syrah but rounder as not as intense. Obviously because of the other components. And I know that may be a deal breaker for some, but it was also a mouthfeel/texture thing. @kaolis what is the alcohol content of the wine? @jhkey Oh yeah, sorry. Didn’t realize it wasn’t in the specs above. 14.5 on the bottle. The wine carries it just fine in my humble. And the Lillian thought was just what popped in my head at the moment. It’s no where near as big/ripe. There was though that similar feel in the mouth that I get with those. @jhkey Still fine today, an ounce or so 20 minutes out of the fridge. A spicy cab, not dark, and maybe a bit of that spice today is a tad of heat showing through?? @kaolis Thanks for the great notes! Oh, and nothing wood/oak stood out at all. Although I think some time will be kind to it and bring things together I thought it was a pretty well balanced wine. I went to school with Nate. I always love seeing his wine as it has become one of the best brands I know of out of Napa. Really cool to see them on Casemates. Any SoCal interest in a case split? @ScottW58, @klezman, @rjquillin, @Cortot, @losthighwayz ? @MarkDaSpark None for me. Already got hit by the madness! Given the meager <5% case discount, and the reasonable rat from @kaolis, I was thinking of just getting a couple, so I could be a bit of help. Well, unless some others say yes soon, I guess we will order singular. @kaolis @klezman @losthighwayz @MarkDaSpark @rjquillin @ScottW58 some do, some don’t. I don’t really care. If the bottles have signs of heat damage a refund is requested. Otherwise all is good. Yup, that’s my plan too. The Noceto case had heat issues - got it sorted to my satisfaction without any difficulty. @CorTot @klezman @losthighwayz @MarkDaSpark @rjquillin @ScottW58 First of all I would rather take the heat issue out of the picture, not worry whether it’s an issue or not upon delivery. Second of all boys/girls, I’m lazy and have boxes that have been delivered a year or two or three or more ago and the shipping carton hasn’t even been opened yet. So there! Ha! And cheers to ya’ll, another Labor Day come and gone already…how’d that happen?